CraftyCarolineCreates: Paisleys and Posies Lined Gift Box with Hand Stamped Paper - Video Tutorial using Stampin' Up Products. 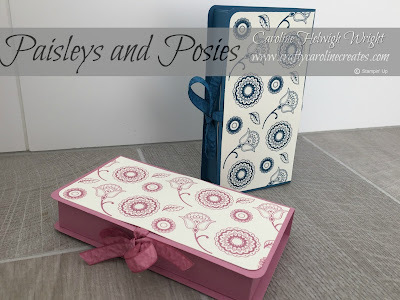 Paisleys and Posies Lined Gift Box with Hand Stamped Paper - Video Tutorial using Stampin' Up Products. As regular readers will know, I am a big fan of hand stamping my own DSP and todays project uses hand stamped DSP. Usually I create it by using stamps to make a random pattern all over the paper but for today's project I hand created a repeating regular pattern - what do you think? I really like it and it so easy to do - just watch the video to see how. 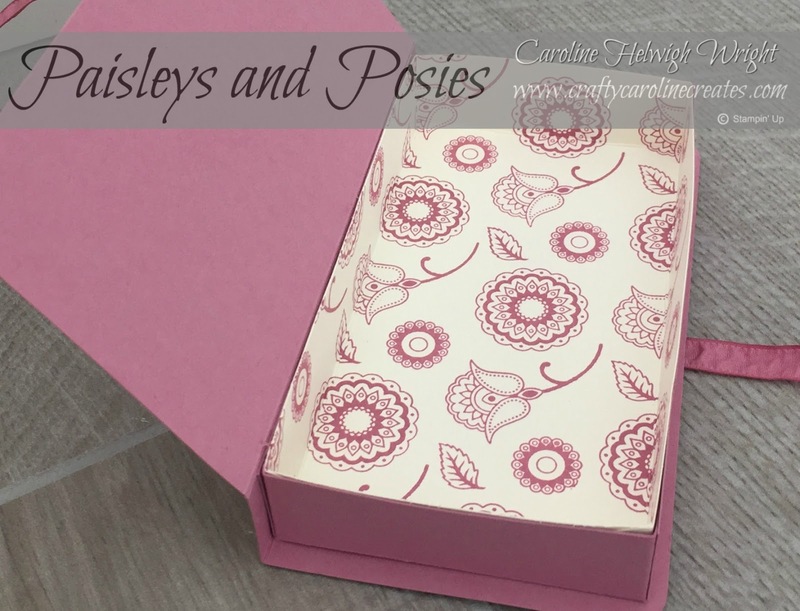 I've really increased the impact of the hand stamped paper by lining the inside of the box with it as well - it gives a lovely little surprise when you open it up. 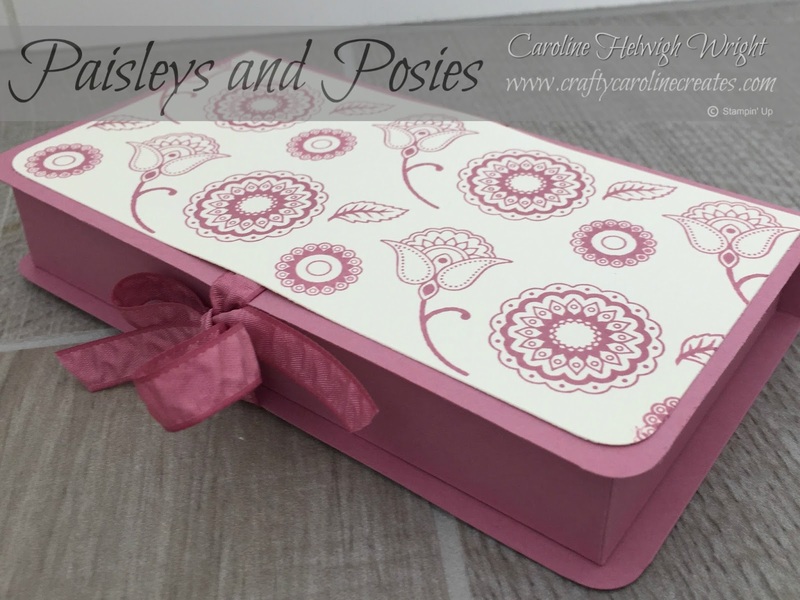 In fact, I think it is almost too pretty to put anything inside! I created the pattern using the new Paisleys and Posies stamp set. 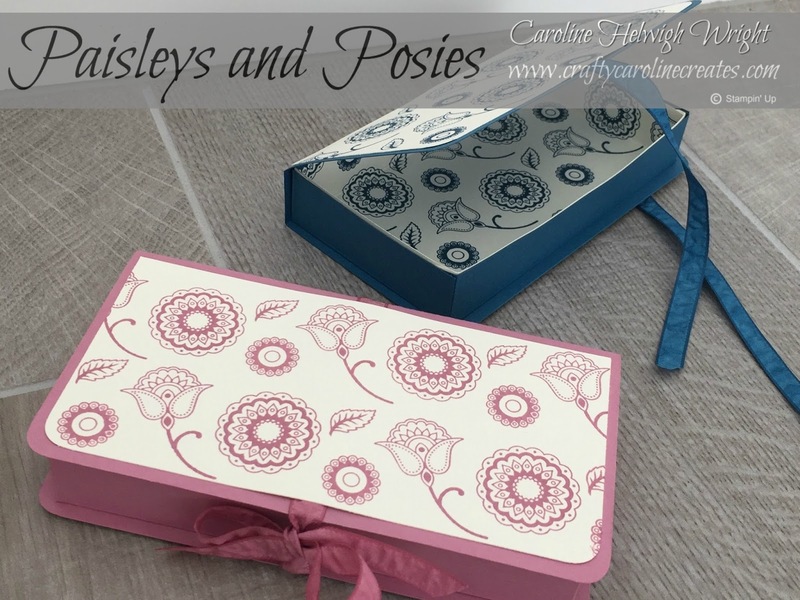 I know a lot people thought this one was right up my street but I'll be honest and say I wasn't blown away straight away, as I mention in the video, I think the sentiments put me off but now I absolutely adore it - the stamps are so pretty, so detailed and so versatile. I hope you enjoy the video, click HERE to view of watch it directly below. A big thank you also to everybody that has been asking how Alex is getting on. Well he turned 11 weeks yesterday and is doing great. 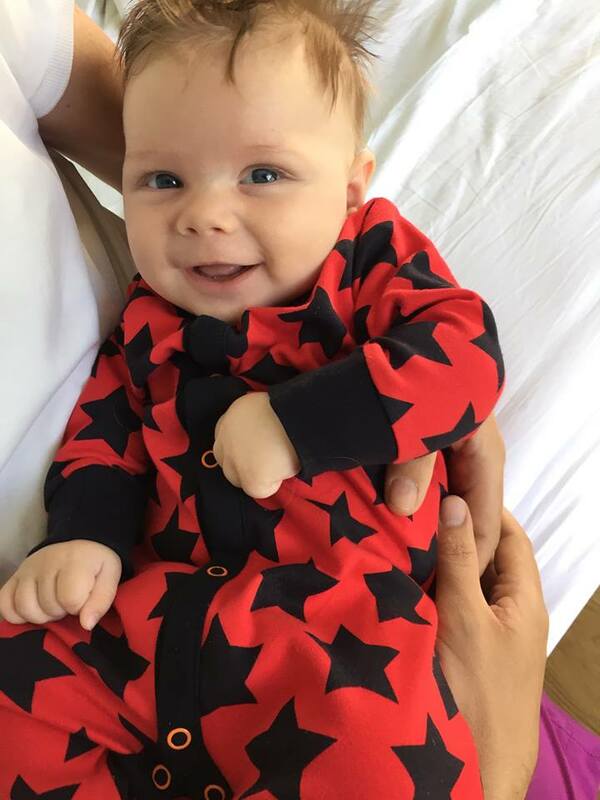 He is growing very fast and is such a happy, smiley little boy. Here he is yesterday morning - no Monday morning blues for him. Score at 1 inch on all 4 sides. Cover Matt Card Stock - 3-1/4 by 6-1/4 inches. I would love to see the video on how to make this great box, however, I don't see it. So sorry - I don't know what happened - I have added them now. As soon as the sentiments were taken out of this set I saw it in a different light altogether, I can now see how cool it really is. Another great box design too. Did wonder if you'd bought the dies to match? Yes - the sentiments are a distraction to the rest of the gorgeous stamps. I couldn't resist the dies, makes sense to buy the bundle. I was using them yesterday actually.